Harry Potter: Hogwarts Mystery came out yesterday. There was a good amount of buzz from Harry Potter fans who were excited to make their own story in the series. However, the fact that it was going to be a mobile release had a lot of people worried. After all, mobile games aren't known for their best practices in regards to monetization. Well, after playing it for a good long while I know all I need to know about how the game works. To put it simply if you aren't a big Harry Potter fan walk away from the game in its current state. It is essentially unplayable to you. 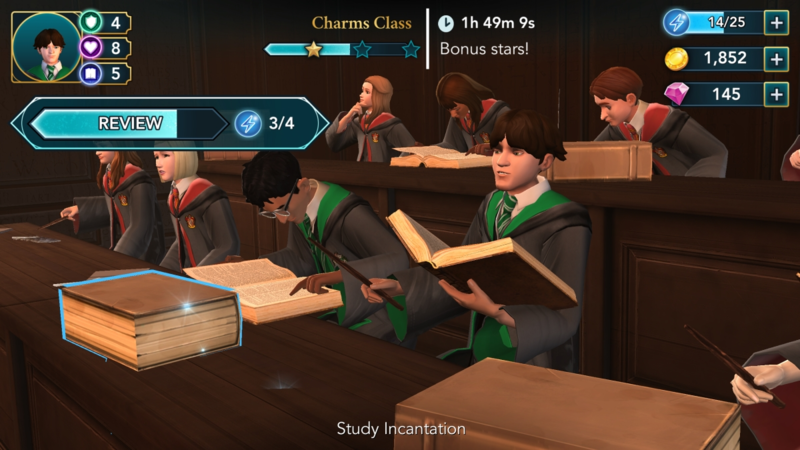 I'd even hazard to say for many Harry Potter fans who get excited at the thought of being classmates with Nynphadora Tonks that it is a tough pill to swallow. Again I'll try to start simply with why. The game is essentially using old Facebook game wait to play mechanics, like the old mafia ones that were huge at its inception, and shoving them into an immersive RPG. Jam City made this game with the intent of making money, but wanted to make an RPG. They seemed to have no idea how to monetize a game outside of offering expensive custom clothes, and making the game not really any fun with the in-game mechanics. The way to have fun is by spending money to overcome the mechanics, and every now and then you get a taste of the fun. It's still weird for an RPG when there's nothing to do in your downtime when you have no energy. You just have to wait, even if you aren't in a task. The game has a rough playtime of two minutes where you can do actions before you have to wait about another 2 hours (4 minutes for 1 action) for your energy to refill. You go into the game click a bunch of action buttons, get some rewards, maybe answer a question about Hogwarts tirvia, trace something on screen, or have to time a screen press, but then you're done. It takes no time at all to do, and the only exceptions are when you get glimpses of the story. The story seems interesting enough. It's just so rare to actually get to the story parts. What is frustrating is that it's already so difficult to push through using the rules to my advantage, and I'm only in the middle of my first year. Games usually scale in difficulty, so I can only hope this is as bad as it gets and the game doesn't get even more unplayable later down the line. Harry Potter: Hogwarts Mystery is sad. The game looks like it could be a lot of fun, but because of mismatched and archaic mechanics it isn't. They don't even have anything other than premium currency that can recover your energy. It's just one big mess. If I had to rate this game, I'd give it four broken wands out of 10. Hopefully they add some patches to fix the issues, but it took Warner Bros. how long to patch out the marketplace in Shadow of War? Well, they said that hurt the game mechanically as well so maybe a few months down the line this game will be somewhat playable. Here is a link to the game. Follow at your own risk as they ask you to rate it before they hit you with the waiting mechanics.